In case anyone still doubted which side organized labor is on in the battle between SEIU and UNITE HERE, the AFL-CIO has joined the now overwhelming number of groups backing the latter. In addition to the international Presidents, Labor Councils across the country have passed formal resolutions attacking SEIU’s raids, even in cities like Los Angeles where SEIU has strength and organized heavily against the resolution. Its quite clear that there is deep respect and affection between UNITE HERE President John Wilhelm and the nation’s other union leaders. Andy Stern, to put it politely, is viewed much less sympathetically. The fact that an international union president would publicly issue such harsh personal attacks on another union leader should give one pause, particularly in light of similar disparaging comments made about Stern by the leaders of AFSCME and the Laborers the preceding day. Regardless of what one thinks of these leaders or the merits of their charges, it is clear that John Wilhelm is widely trusted by his fellow leaders – while Andy Stern is not. And if you are in the business of building a labor movement, as SEIU claims to be, alienating your colleagues is not a winning strategy. Much of the Convention’s second day was spent hearing how workers in the gaming, food service, and hotel industries were moving forward on their agendas. Jackie White, a Hyatt Hotel worker in Indianapolis, discussed how maids had to do up to 28 rooms a day for as little as $7.25 per hour – this is double the rooms and half the pay of unionized maids in Chicago. Indianapolis is the nation’s largest city without unionized hotels, and UNITE HERE is working hard to change this. D. Taylor, head of UNITE HERE’s gaming division, described an ambitious agenda for expansion both in currently unionized cities and in new states. Taylor noted that a nationwide campaign against the Penn-National gaming company is in the works, which would involved 10,000 workers in over five states (until this convention I had no idea that states like Ohio have gaming, and that it is very pervasive in Illinois, Pennsylvania). I spoke with Noel Beasley, an Executive Vice-President of Workers United and the Manager of the Chicago-Midwest Joint Board about the statement of the 15 union heads condemning the raids. Beasley said their position was “not particularly surprising,” as they urged an amicable settlement and SEIU is not involved with any raids. According to Beasley, “we have the right to organize in the gaming, hotel and food service jurisdictions.” He said that’s what he and his colleagues have been doing for the past five years, and they intended to continue. He also claimed that 50% of the workers under his jurisdiction chose to leave UNITE HERE for SEIU; sorting out the numbers is difficult, but Beasley insists that if workers were happy with UNITE HERE, they would not have voted to leave (the nature of these “votes” remains one of the outstanding disputes). Under Beasley’s reasoning, those organizing truckers for the Teamsters could then leave for the United Food and Commercial Workers and then have the “right” to organize truckers for their new union. No wonder nearly all of the major labor unions are so alarmed at SEIU’s jurisdictional analysis; as Terrence O’Sullivan said yesterday, if SEIU can begin competing in UNITE HERE jurisdictions, then there is nothing to stop it from going after other unions, ensuring ongoing inter-union fights. The San Francisco Bay Area was well represented yesterday, as Fred Ross Jr. cited his earlier Beyond Chron story explaining why he left SEIU after ten years to help UNITE HERE. The normally reserved Ross gave a fiery speech that repeatedly brought the crowd to its feet; it will not prove popular with his former SEIU colleagues. Tho Do, organizing director for UNITE HERE Local 2, spearheaded the presentation on the union’s hotel organizing campaigns. Tho Do was later elected to a position with the international union, an inspiring achievement for an activist who got her start, and has spent her entire career, working in San Francisco’s Uptown Tenderloin district. The Convention’s final day is expected to feature a speech from UFCW President Joe Hansen. After all the speeches, delegates will head to the Congress Hotel in a show of solidarity with the workers on strike for over six years. 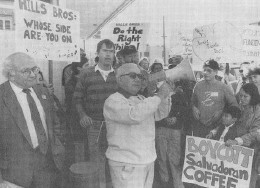 Randy Shaw is the Editor of Beyond Chron and the author of Beyond the Fields: Cesar Chavez, the UFW and the Struggle for Justice in the 21st Century.